collusive ties between the government and businesses. on issues regarding violations of the Public Service Ethics Act. the jurisdiction over the public official concerned examines the propertyregistration and property acquisition process. Korea Hydro & Nuclear Power and public service-related organizations must also register their property. Registration Agencies, Timing and Method for Registration, etc. Transparency Initiative(PEIT) System and report their current personal and family details, as well as property, online. Judges of the Constitutional Court who are elected by the National Assembly. Disclosure Agencies, Timing and Method of Disclosure, etc. in the official gazette or public bulletins. A public service ethics committee reviews the registered details of persons liable for property registration. the period of review may be extended by up to three months by a resolution of the public service ethics committee. it can request a report or material necessary for the review from relevant institutions or organizations. and concerned persons in matters of property registration and ask those persons to make statements. to the inspection belongs and the court. By requiring public officials who are likely to face a conflict of public and private interests given the nature of their position and duty to register their property and reviewing the reported details, unfair acquisition of property can be prevented. 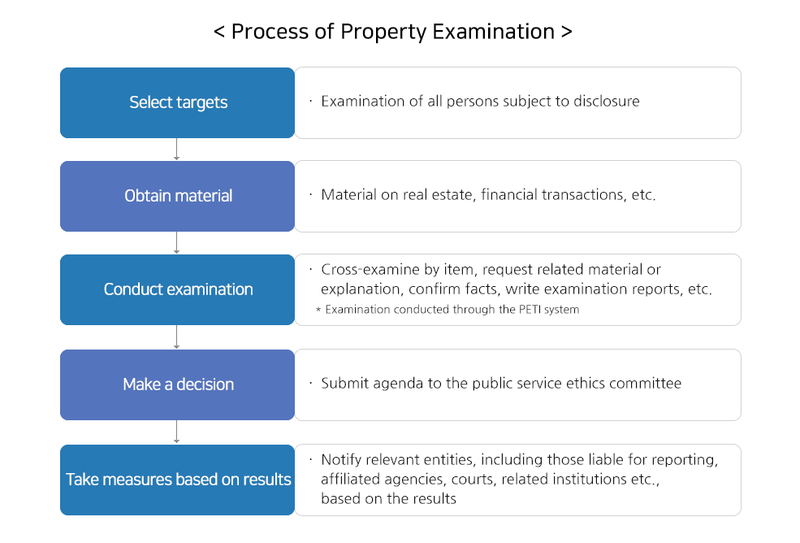 Furthermore, the process helps to improve the transparency of property holdings by public officials and the fairness of the policy-making process by enabling the supervision of the media and citizens over the property holdings of high-level public officials. private and public interests in the process of performing official duties. Ownership of stocks that are not related to the performance of official duties may be maintained. lineal ascendants and descendants) exceeds 30 million won, such stocks must be placed in a blind stock trust. that their stock holdings are related to their current duties, they may request a review of relevance after a change in their position. an arrangement was introduced in 2015 to avoid conflicts of interest in the duties of public officials. details in the official gazette or public bulletins. When high-level officials maintain stock holdings, it is likely that they will try to make policy decisions in a way that increases the value of such stocks. 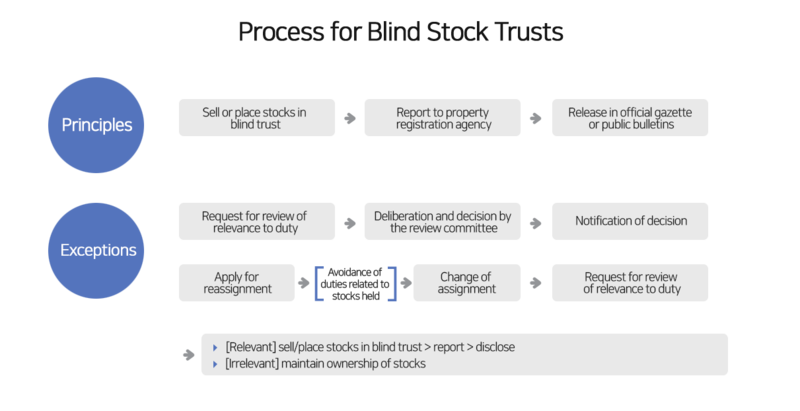 in policy making with blind stock trusts by preventing in advance the conflict of public and private interests that can arise in public service. to retirement. Moreover, retired public officials must not request employment favors or assistance from incumbent employees and affiliated institutions. Persons Subject to Employment Screening, Employment-restricted Institutions, etc. 3 years from the date of retirement. However, employment may be allowed with the approval of the relevant public service ethics committee. organizations, and duties of affiliated departments for public officials of grade 4 or below and employees of public service-related organizations. acceptance, direct supervision under Activities and subordinate statues, investigations, reviews and rulings on cases, etc. universities; general hospitals and corporations that established such hospitals; and social welfare foundations that exceed a specified scale. on duties of persons subject to employment screening based on the duties of an agency. legislation. There are no restrictions on the institution and time period. institution to which they are employed. Subject All retired public officials, employees ofpublic service-related organizations Public officials of grade 2 or higher,executive officers of public service-related organizations, etc. concerned to perform the duty with the approval of the relevant public service ethics committee. duties by employees of the affiliated institution for the benefit of themselves or a third party prior to retirement. he/she must not be subject to any unfair treatment including disciplinary measures or discriminatory working conditions from the affiliated institution due to the report. Prohibition of Requests for Employment of Incumbent Persons, etc. performed in the five years prior to the date of retirement. and ultimately, to strengthen the trust of citizens in public services. context of diplomatic and international practices. Therefore, in such cases, gifts may be received so long as they are reported without delay. receiving the gift is affiliated. 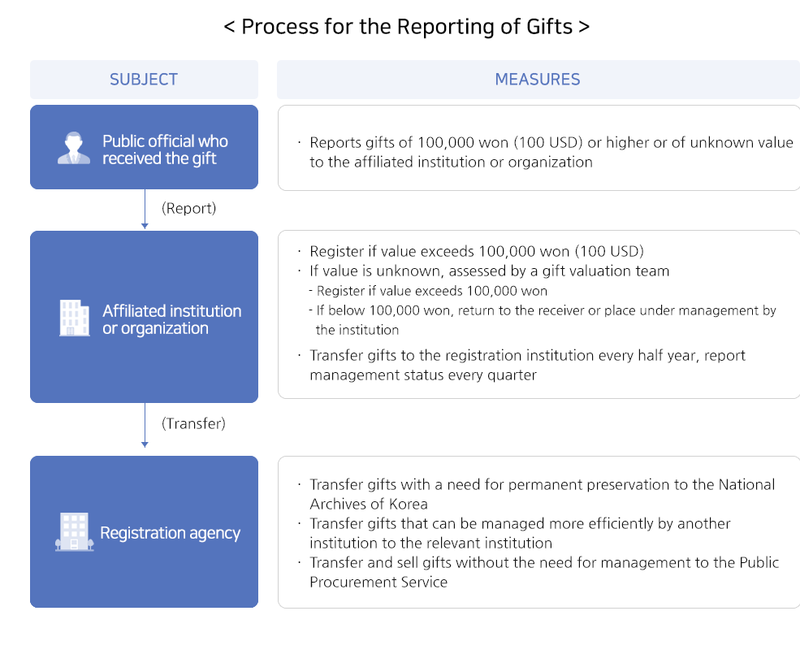 Gifts that are deemed to be of value below one hundred thousand won do nothave to be reported. 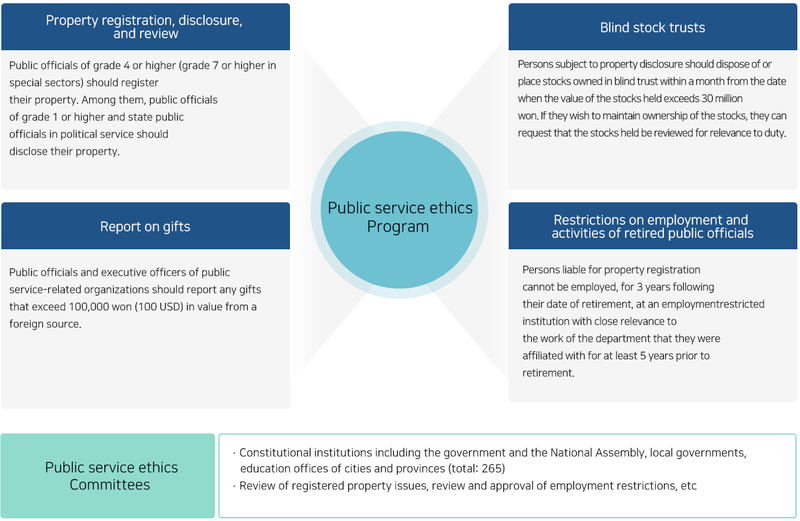 This process helps to improve the ethics of public officials by requiring officials to report gifts that must be accepted in the context of diplomatic and international practices and managing the reported gifts strategically as national property. property through the PETI system. public service ethics program through the provided informational resources, which can be accessed without logging in. provision agencies currently utilize the PETI system. advance. By linking the system with the real-estate value notification system, the value of an official’s real estate holdings can be checked in real-time.